Home / Features / Making the Transition: Is Austin Rivers Really the Worst? 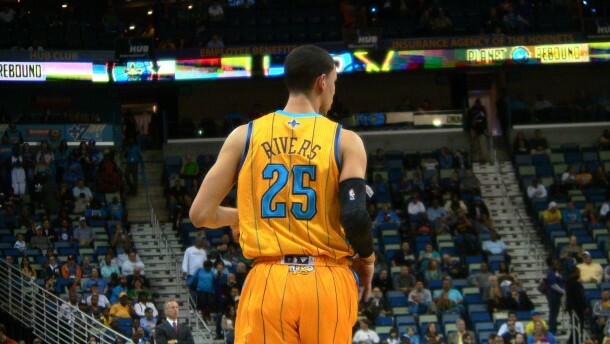 Making the Transition: Is Austin Rivers Really the Worst? Just yesterday, ESPN Insider ran a story that set out to answer one simple question- Is Austin Rivers Having the Worst Season Ever? For those without Insider access or who simply lack the desire to read another anti-Rivers column, the author (Kevin Pelton) uses a player metric that he created for the NBA called WARP (Wins Above Replacement Player) and according to his projection, Austin Rivers is on pace to have the lowest score in the thirty-four year history of this metric. In order to balance out the perspective and help the answer his own question, we have posed some questions ourselves. Pelton is projecting how Rivers is finishing the season, but he is using the numbers Rivers has just a third of a way through the season. For the projection to be accurate, Rivers’ numbers over the final two-thirds of the season would have to mirror what we have seen from the first third. Here’s the problem with that, though- his numbers already look drastically different over these past three weeks when you compare them to what he was producing earlier in the season. Since December 7th, his points per game has risen by 50%, his field goal percentage is up 12%, and he has increased his rebounds and three-pointers made per game, all while decreasing his turnovers. Even if he just maintains the numbers that he has produced in this recent ten-game stretch over the rest of the year, his end of season numbers will be quite respectable as the horrific numbers he posted in the first 16 games will be diluted. But what if he continues to improve? We have seen major jumps in the last three weeks, and while it might be unrealistic to see the numbers spike that much again, is it beyond the realm of comprehension that a guy who works as hard as Austin does will get even better? We have seen his PER practically double over this stretch, and even if he just maintains this recent play for the rest of the year, we are looking at a PER close to 10. Another jump in production could put him in the very respectable 11-13 region should Rivers sustain that improved play throughout the remainder of the season. Increased individual numbers combined with better play from the Hornets as a team (and more wins) will drastically increase Rivers WARP numbers. It would take actual regression from Rivers at this point to maintain Pelton’s projection, and it would be surprising to see Rivers or the team move backward. This regression would also have to maintained while netting the significant minutes he has played up to this point. This could be affected by Monty reducing his minutes per his decision, injury, and an altered role to due to the expected return of Eric Gordon. Any statistic is limited. The more complicated the statistic, the more important it is to understand the limitation. WARP is immensely complicated, relying on layers of computations. The reach of the statistic is part of its power and value, but this power must be viewed along with its inherent limitations. According to the creator of the statistics and the author of the recent Rivers article, there are natural limitations to WARP. Like all rating systems based on box-score data, WARP cannot account for contributions that are not tracked in the box score, most notably on defense. It does no better than linear weights methods at evaluating players like Bruce Bowen. Also, it requires a number of assumptions – the value of assists, the trade-off between usage and efficiency, and replacement level. Generally speaking, a team’s total WARP plus the 10 replacement-level wins will be similar to its final win total. These tend to differ more for teams that are very good or very bad on defense, because not all of the team’s defensive performance is credited to its individual players. Some is assumed to be the function of the coaching staff and some we simply cannot fairly apportion to the individual players using box-score stats. Team WARP totals also differ from its record in the case of teams that outperform their Pythagorean projections. With the Hornets having the 29th best defense in the NBA (they out-defend Charlotte), it calls into question if Rivers’ input data is appropriate. Besides the potential for WARP to not predict wins for teams with extreme defensive prowess (in either sense), extreme defense at a team level can affect a player’s WARP. These are the purely individual categories. The other two reflect team defense, and are not individually counted in the statistics. The two general schools of thought on team defense are to assign all of the credit to individuals, or none of it, and rate every player at league average. I’ve found a happy medium between the two. What I’ve done is create what I call a “team defense factor” (TDF), which is simply Min/TmMin. If a player was on the court every minute of every game, this ratio would be 20 percent (TmMin includes minutes for all five players on the court, which is why you repeatedly see it divided by five in previous calculations). Self-explanatorily, this determines how much of the team’s defense the player gets credit for. What we’re assuming is that each player is equally responsible for the team defense his team plays while he’s on the floor. That’s not true, of course, but it’s a reasonable compromise. This lowers the WARP of other players’ on team by attributing the horrible defense to them individually, but the argument presented is not that Austin Rivers is horrible; the argument is that he is historically horrible. Preferentially piling on terrible team defense into a poorly playing rookie’s reckoning due to massive minutes he’s playing that a totally out-of-line with his poor production is suspect at best. This brings into question the use of a statistic like WARP to evaluate this Rivers’ play. After all, a WARP has two main components, according to the author: minutes played and per-minute-production. When per-minute-production is lower than replacement level, increased minutes played decreases the WARP statistic for the player. A certain number of minutes played are needed to ensure the per-minute-production is robustly estimated, but Rivers is playing more minutes than any rookie excepting Davis, Beal, Waiters, Lillard, and Sinlger (among those on pace to play at least 500 minutes for the season). The first four were chosen 1, 3, 4, 6, thus not available at 10, and Singler is a 24 year old drafted last season but who spent a season in Europe before joining the NBA. These players, excepting Singler, however, are performing better than replacement level and playing them more than Rivers is logical, or at least has the potential to be so depending on the alternatives. Using wins gives a measure of value that is easy to understand and constant over time. A rational coach who understands his players’ contributions will deploy a player with the lowest per-minute production on the team less than those with higher per-minute production when trying to win games at the highest possible rate. When the goal is to develop the player so that the maximum per-minute production is achieved sooner, then the statistic is not comparable to other similarly computer statistics for other players. After all, the team is not going after wins, at least wins during this season. Additionally, Michael Beasely is producing at a rate lower then Austin Rivers according with WS and WS/48. This shores up the idea that the per-minute production being influenced by Rivers’ heavy minutes on a poor defensive team. Beasely plays fewer minutes on a team that is slightly better defensively, both of which affect Rivers’ WARP negatively compared to Beasely’s. Again, this shows that Rivers is merely a very bad player today, not a historically bad one. Unlike Beasely, there is realistic hope that Rivers will improve. After all, some improvement has been noted. To Play Poorly or Not to Play. Which is Worse? That is the question! Finally, we have to address the question that this article aims to answer by using this statistic – Is Austin Rivers having the worst season ever? Even if we were to grant the author his claim that WARP is a superior measuring tool and also grant him the claim that Rivers numbers will not increase, thereby giving him the lowest WARP in history, does this support the claim that he is having the worst season ever? Which is worse, playing poorly or not being viewed by your coach as good enough to play? When you look at it in relation to the value of a player to one’s team, is Austin Rivers or Terrance Jones having a better season? Rivers is putting up bad numbers for a Hornets team that is struggling, but has he not helped them win a game or two at the very least this season? His third quarter performance last night against Orlando helped them to jump out to a double digit lead, his 14 points and 6 assists with three key treys at Los Angeles helped them beat the Clippers, and so on. Meanwhile, Terrance Jones has only gotten off the Rockets bench in garbage time and is currently spending his time in the D-League. This can be said not only for Jones, but for the majority of players taken after Rivers in this year’s draft. Some may say that Rivers hurts his team more than he helps because he is playing so much and that if you were to just insert a replacement player in his place, that the Hornets would be much better off. That is easier said then done however with this roster. The other guys who have gotten their turns at the shooting guard position, Darius Miller, Roger Mason, and Xavier Henry, are all below replacement level players so giving Rivers minutes to them likely would do nothing to improve the Hornets record. What you have here is a player, who like most of his fellow rookies, is not ready to play heavy minutes in this league. He was forced to because of an injury to the team’s superstar and has struggled because he was given responsibilities that he was not ready for quite yet. While he started off at a historically poor rate, his numbers have jumped recently to the point where he is still poor when viewed as a starting shooting guard, but average when viewed through the spectrum of NBA player – 1 of 450. Upon Eric Gordon’s return, he will be moved into the role that he should have assumed all along and his numbers should shift quite drastically again, but that is not in Mr. Pelton’s projection. I am sure this article got plenty of page views and attention, and it is interesting to think about, to pontificate about the future of a young man just 18 months removed from his senior prom. But alas, it does not seem that the projection will come true. While we are likely to witness a season in which Rivers struggles, as most rookies do, it will by no means end up being historically bad. Making the Transition is a Weekly piece that you can find every Thursday only on Hornets247. For past columns in this series, click here. The D League is where you go when you can’t get any minutes, a problem The Hornets and Austin do not have. They’ve also used The D-League to punish a player.. there’s certainly more to the story than just a lack of minutes. I think this guy is a talented player with no experience and a fragile body for the pro-level. Has a long way to go. Should have stayed another year in college for his own good. And if the kid scores 30+ points and dishes 10+ assists he would be an All-Star. Also, water is wet and the sky is blue. Good article. Austin Rivers bashers never cease. Had his name not been Rivers, most would merely say he’s a talented rookie struggling like many before him who weren’t ready for the NBA. Actually, had his name not been Rivers, he would not have been drafted at 10th overall. Not even close. Not really. I honestly don’t associate his father with Austin at all. He’s a terrible player all by himself, regardless of who his father is. To maximize headlines, the bash Rivers article had to be written now. Now is when he still looks horrible and before the upturn in his play extends long enough to significantly improve his WARP. Rivers still has a long way to go, but he is improving and has turned the corner. Now he is about to play almost exclusively against 2nd teamers which will also improve his stats. Let’s revisit this at the half way point in the season. Less than a handful of games away from the halfway point in the season. He is not improving, and has NOT turned a corner. -Stats still have not improved. Past 10 games: in 20 minutes he’s only shooting 23.2% from the field, getting 1.7 assists and 1.2 fouls with 3.1 points. In January so far, playing againsted “2nd teamers” that you claimed would improve his stats, he’s averaged 15 minutes and shot 13% from the field. Gotten 1.5 points and 1.2 fouls. In January so far, he’s got 13 FGA and only 1 shot made. 0 free throw attempts. 5 turnovers. That from a player averaging high-role player minutes? In the 11 games that his team has won, he shoots 23.7% from the floor with only 3 points and almost 2 fouls. Still in over 20 minutes. No, Rivers is not getting better. He needs to be sent down to the D-League. Agree at this date, which is close to the season midpoint. Austin is a couple years away from being NBA-ready. Let’s hope he gets there. Better pick than Royce White, though. Rivers will be fine…..the kid is still young. His jump shot needs to be tinkered with, and I think the Hornets can help him out by giving him minutes at the proper position. We drafted him to be the PG of the future, but he’s always in the game with ball dominant PGs (Roberts/GV). I completely agree with you. Let him get a run at pg. I watched Rivers at duke and I’ve bought league pass to watch my team this year and its a drastic difference. U could tell that coach k told Rivers to bring the ball up, shoot first pass second…..and he listened. In the summer league coach Monty told him that he wants a pg that brings the ball up and pass the ball and initiate the offense before looking to shoot…and Rivers listened. I feel like Rivers is learning and progressing from what his coach tells him. And I, for one, will not give up on him for a good while. I just hope the don’t trade him trying to accomplish a win now mentality. Rivers listened in the summer league. But the results were atrocious. Hornets can help him out by sending him to the D-League. More minutes is not the answer, as his ENTIRE SEASON SO FAR has shown. On the statistical analysis issue.. Any method must pass the test of reliability and validity… Stat 101… And why aren’t we comparing players with the same attributes… Rivers should be compared with Collison and others with the same height, weight, time in college, etc..
People tell lies with statistics.. But is there really enough data unless you are comparing his progress with others.. I agree. Lets talk about the scoring we get from SG and SF. According to bloggers it seems always Vasquez and Lopez are the major problem, but I think, looking at the big picture, the real concern are the lack of reliable Shooting Guards and Small Forwards, but that´s never discussed. How come? Lets see our SG and SF PER: Miller 6.05, Rivers 6.74, McGuire 8.18, Mason 8.26, Henry 9.40, Thomas 10.07, Aminu 12.79. Rivers was drafted because Monty is friends with Austin’s father i hate that because bloodlines don’t mean nothing if you’ve high expectations on a player thats not going in a level you want them to be.Austin shoulda stayed at Duke then came out in 2013 as a top 5 pick at least.Dispite drated at ten in 2012 was a big mistake this kid was high on their board they wasn’t looking at anyone else at ten it was all about Austin.He’s not NBA material he’s BUST stop with the he’s 20 and he’s a rookie.Not all rookies wont be successful in their first season but this kid looks like he never played before. Hornets are basically paying Rivers for a year of development that would have been better done in college. Rivers has the potential to be a player one day. But that day is some time away, even if he’s playing a bit better recently. He needs to develop somewhere, and the NBA court is not the place for it. Perhaps the D-League, or overseas. Rivers is going to be a stud in this league, he’s far more physically gifted then critics give him credit for, he’s one of the hardest working kids Monty has dealt with and he doesn’t let stupid articles like Pelton’s get to him. Im pretty sure he’s doing exactly what Michael predicted in a season preview podcast and is by no means behind schedule in his development. Michael predicted that in the past 10 games in 20 minutes he’s only shooting 23.2% from the field, getting 1.7 assists and 1.2 fouls with 3.1 points? In January so far he’s averaged 15 minutes and shot 13% from the field. Gotten 1.5 points and 1.2 fouls. Michael predicted that he’d develop like that? I’m certain he didn’t. If he did, he certainly wouldn’t have given Rivers a starting job so many times this season, nor would he have averaged minutes as high as he did. It’s easy to see Autin’s potential. He has a quick first step and a nice floater. I hope in about 3 years when he starts to “get it,” the Hornets do not trade him away. As for now, he is a 19 year old. He will be better, maybe. Some players never do “get it” though. As for now, I can’t think of a worse lottery pick in the past 5 years. That article – the ESPN Insider, not this one – is ridiculous. The truth is this: Austin Rivers is having a tough year – and it’s not even *that* tough. Rivers is averaging roughly 8-3-3 in 28 mpg, which has included 20 starts. He has shot – for the season – 35% from the field and 36% from behind the arc. Look at those numbers. If his FG percentage was even 40%, this would be an absurd conversation. He is having trouble finding his shot, and it shouldn’t surprise us as to why: he spent *far* too much time being played out of position as a “combo guard,” when he is very clearly a pure SG. It couldn’t be more obvious. Now that we have our full squad, he will be getting more minutes where he belongs and you’ll see a big upswing. Count on it. And if he was Michael Jordan, this would be an absurd conversation. Looks like you were wrong there. He’s doing even worse than before. I wish NOLA would deal Rivers, or at least send him to the D-League like Kendall Marshall. I wish the best for NOLA, but Austin Rivers should not be a part of their future. Im not a Rivers basher. He’s got a good gam and skill set. But he isnt NBA ready. Another year or two at Duke would of served him good. Given that he could of been a candidate for Rookie of the Year. But is not physically or mentally ready to play in the NBA as a starter, especially with the minutes that have been forced upon him. If Gordon wasnt out and Rivers could of came off the bench as a role player, his stats would be better. But he was thrust into a starting position just a little over a year after his high school graduation. As a role playr he’d thrive, but he’s not starting material. Give him a few years for that. But think about it. What are the hornets gonna do? Start Mason or Henry? Rivers was the only one they could start in Gordons place. So ease up on him. I agree he isn’t NBA ready. But he’s already come off of the bench as a role player, and his stats were STILL CRAP. He’s a role player now, and he’s STILL not much better. Also, yes Mason or Henry, for example. You’ve got Roger Mason Jr., who IS shooting better across the board in comparable minutes. You’ve also got Brian Roberts, who is assisting just as well as Rivers (2.2 assists for both) in half the minutes as Rivers has. Also about half the turnovers. He’s also shooting better FG% and 3P%, and with an awesome 92% FT percentage. Why not play them more minutes? As another last-ditch options, you can use Darius Miller or Al-Fariq as a SG (there have been taller guards than them). How the hell are there no quality guards after Gordon and Vasquez and Rivers is still getting tons more minutes than these guys, despite shooting an dplaying like crap, and turning over the ball??? HOW IS RIVERS THE BEST OPTION? In fact, I would even go so far as to say that the reson they are losing is because they play Rivers for 23 minutes per game while these guys, who obviously shoot and score better, are sitting on the bench. In January, 16 games and 2 starts, he played 15 minutes per game despite shooting a horrendous 28% FG and 16% 3pt, with 39% FT and 3.1 ppg. Anybody else would’ve been benched, getting not even 6 minutes per game while he gets 16.